Amazon Price: $14.79 $14.79 (as of January 27, 2018 4:14 pm – Details). Product prices and availability are accurate as of the date/time indicated and are subject to change. Any price and availability information displayed on the Amazon site at the time of purchase will apply to the purchase of this product. Almond & Coconut is a guilt-free way to satisfy any sweet tooth with a hearty blend of almonds and coconut, 4g protein and 4g fiber. 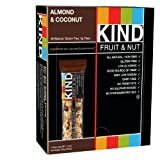 KIND is more than just a brand of award-winning whole nut and fruit bars made from ingredients you can see and pronounce®- it is also a movement and way of being. At KIND, we aim to make the world a bit kinder through all that we do and how we do it- from the products we create to the way we work, live and give back. And that may be why nutritionists, foodies and social leaders alike all agree that KIND is the best snack around!